If you are looking for uplifting thoughts, you will enjoy the the angel quotes presented here. 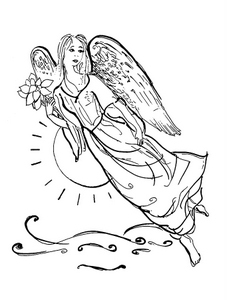 This small angelic collection comes from different sources: literature, the Bible, mystics, authors, and angel experts. As you would expect, these thoughts and sayings are filled with hope, wisdom and spiritual power. I hope that these quotes about angels bring a little bit of sunshine into your day. "Angels and ministers of grace, defend us! Did you find among these a favorite angel quote? I like them all. If you’d like to read more angel, fairy quotes and inspirational quotes, please visit the following pages.